Think&Drink: Share. Socialize. Win Money for Your Art. On March 30th, 2011 at 7pm at Phog Lounge we’re launching a brand new initiative aimed at getting artists together and funding new projects! 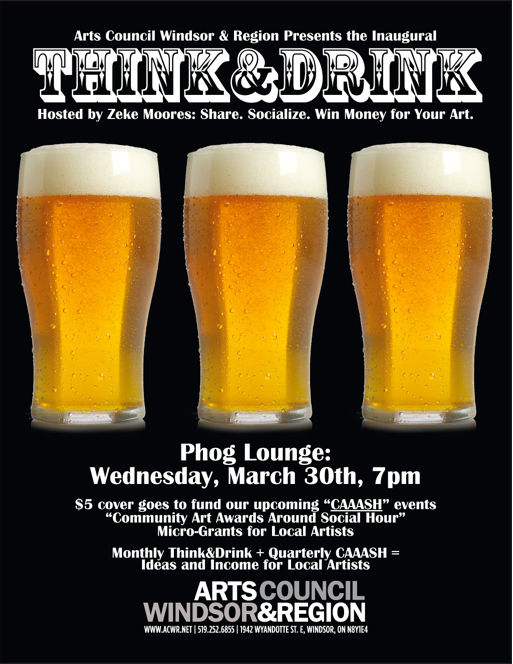 Think&Drink is a new monthly discussion night hosted by our board member, the infamous Zeke Moores, which will connect local emerging and established artists. Every few months, we’ll also host an event called CAAASH (Community Art Awards Around Social Hour). You’ve heard of this before — think about FEAST, SOUP, and Phog Philanthropy — basically, micro-grants for artists. The goal is simple: help artists connect with one another and fund their projects. At CAAASH, artists will be invited to make a 5-minute grant pitch. At the end of the night, everyone will be invited to participate in a silent vote, and the winner(s) will walk away with the cash that night. And the $5 cover charge at every Think&Drink builds the grant money pot and 100% of it gets handed over to the winning artist(s). If you’re reading this, you’re invited. Visual Artists, Musicians, Performing Artists, Designers, Filmmakers, we want to see you there!!! This entry was posted in Uncategorized and tagged art, beer, money, Think&Drink. Bookmark the permalink. I think im liking this. Think n drink, your a genious!